I haven’t been including audiobooks in my international crime spree, partly because the suitable pickings at my library are slim. So Ira Levin’s 1953 debut, A Kiss Before Dying, doesn’t fit with the international theme, but it is a crime novel. In fact, it’s a few different kinds of crime novel all rolled into one surprisingly coherent package. Levin ingeniously takes a psychological crime novel that puts readers into the mind of a murderer and turns it into a whodunit of sorts, complete with an intrepid amateur detective, multiple suspects, subtle and unsubtle clues, and heaps of misdirection. Then, he caps it off with a section of full-blown suspense, in which readers know the score from the beginning but don’t know how things will turn out. The book begins with a young couple in trouble. The young woman has just discovered she’s pregnant, ruining her and her boyfriend’s plan to wait until they finish college to get married. She’s ready to go ahead and tie the knot, but he worries that her rich father will abandon them to a life of poverty. Determined to get out of his commitment, he grows increasingly desperate and eventually turns to a truly cold-blooded murder. And this is just the first. Two other women soon fall into his orbit, and once again, he callously arranges circumstances to his own benefit. The plot is just about perfectly constructed, filled with twists and reversals that left me breathless. The second section in particular is stunning, creating levels of just about unbearable tension. I genuinely had no idea what was going to happen because there were so many plausible possibilities. I’m not going to say much more because this is a book that I do believe can be spoiled if you know too much. In fact, I’m going to plead with you not to even go so far as to look at the Wikipedia page for the book or the movie because they both casually drop a major bombshell. This is a novel that relies on surprise—don’t deprive yourself of that pleasure if you’re thinking of reading it. Just go read it. My only complaint about this book is that the women are all so easily duped and end up relying on men to get them out of trouble. And it’s a minor complaint, given that the book was written in 1953 and is all about a sociopath with irresistible charm. It’s just that these women seemed a little too ready to be charmed by anyone with the right line, and it got frustrating. But again, this is a minor complaint! Don’t let it put you off. Just don’t be looking for girl power here. It’s a masterpiece of plotting, not a masterpiece of girl power. The audio production is quite good. Reader Mauro Hantman employs a slow, deliberate tone, which suits the killer’s cold-blooded calculations. Other characters are voiced well, with each one sounding different enough from the others to make the dialogues easy to follow. And he doesn’t make the error of trying to alter his voice excessively when reading women’s dialogue. I was pleased with it. 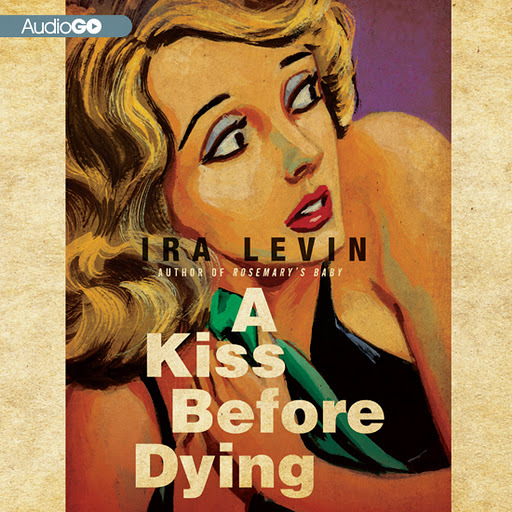 A Kiss Before Dying by Ira Levin. Narrated by Mauro Hantman. 8 hrs., 44 minutes. Audio edition published by AudioGo, 2011. Review copy courtesy of Audiobook Jukebox’s Solid Gold Reviewer program. This entry was posted in Audiobooks, Fiction, Mysteries/Crime and tagged Review Copy. Bookmark the permalink. You remind me that I must read more Ira Levin. I’ve loved every one I’ve read so far. Stepford Wives is the only other one I’ve read, but I’ve had Rosemary’s Baby on my list for years. Any others you particularly liked? I have been meaning to read Ira Levin since I picked up a copy of The Stepford Wives. You remind me I really must read him. I’ve heard nothing but good about his writing and someone who plots brilliantly is a treat. Stepford Wives is great, and it’s so short you could probably read it in an afternoon. I definitely want to read more Levin. I really like him, although I have not read this one. I don’t know why, since I have enjoyed his other stuff. Actually there is a sequel to Rosemary’s Baby and I saw it once and didn’t get it and then could never find it again. And actually your comment about the role of women is interesting, because he definitely shows a sensitivity in his other books so I would imagine that it is on purpose in this book. Yes, he definitely takes an interest in women’s independence in Stepford Wives, so I think here it was either intentional (definitely necessary for the plot) or just a sign of this being an early work. One of the women does some appallingly stupid things, though, even when she seemed the smartest overall. And I had no idea there was a sequel to Rosemary’s Baby! This sounds interesting. I’ve read and some really good whodunit. And regarding the charm, though currently it might be a bit of a cliche (not totally because looks still charm) it works here. And the choice between riches and poverty. Charm can definitely lead even a smart person to act stupidly, and it works well here. It made the villain seem that much more menacing. A KISS BEFORE DYING has one of the all-time great “I didn’t see that coming” moments in the middle of the book. You’re right to warn people not to read too much about this book (or the movie) before reading it. One of its great pleasures is how neatly Levin confounds our expectations. Levin’s book, COMPULSION, based on the Leopold-Loeb case, is also very interesting. I was completely bowled over by that moment! One of the best examples of misdirection I’ve ever seen. I’m sure that the beautifully constructed plot would be a pleasure even if you know what’s coming, but you’d lose the shock value and the tension of that whole second section. I haven’t heard anything about Compulsion, but I’ll look into it for sure. Ooops, my bad! Now I understand why the styles in the two books were so different. Well, whoever wrote it, COMPULSION is a good book, although nothing like A KISS BEFORE DYING. I did want to gulp it down! But I did enjoy prolonging the tension. It forced me to weigh all the possibilities. Oh this sounds good! About the women, I think that was the way they thought of them at the time. Just about every Hitchcock movie I’ve seen portrays them the same way. :( I love the cover art too. I’m definitely willing to make allowances on the depiction of women given the period. It’s bothersome, but not something that kept me from loving the book.